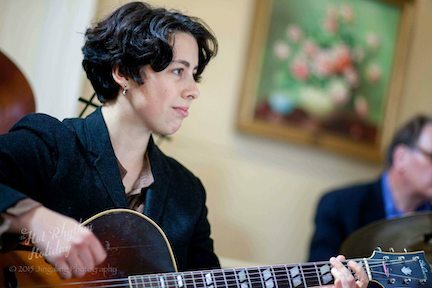 Guitarist, vocalist and songwriter/composer Albanie Falletta has been playing and singing swing music professionally, both as a side-person and a bandleader since age 15. As a freshman in highschool, Falletta began studying under and performing with Austin area swing and jazz Manouche players, including Slim Richey, Django Porter, Ray and Linda Sriro, the Jazz Pharaohs, and others. Between 2009 and 2013 she led a band in Austin called Albanie and Her Fellas, and also played in the Thrift Set Orchestra, a seven-piece collective doing arranged early jazz and original material. In the summer of 2013, Falletta relocated to New Orleans, Louisiana to play full-time, and to study New Orleans traditional music. Shortly after moving to New Orleans, Falletta began making trips back to Austin to study early acoustic fingerstyle blues with Steve James, and to perform with Guy Forsyth, Thrift Set, and the Fellas. She currently performs in and around the crescent city, and tours as a solo act, performing New Orleans traditional tunes, acoustic blues, ragtime, and original songs.